I am happy to announce that I will be presenting at the ACADIA 2010 conference in NYC @ the Cooper Union. My presentation will look at some case studies to examine how design information exchange and collaboration occurs in an international setting. The presentation will also study emerging workflows and evaluate their benefits for integrating teams and maintaining information integrity. For more information, visit the ACADIA 2010 website. The example below provides some basic code for establishing a COM connection to AutoCAD using VB.NET. After a connection is established, it is then possible to send remote commands to the AutoCAD command-line as well as automate other features in the program. The screenshot shows a custom Grasshopper VB.NET component using this code. My lecture for the BIM Analytics symposium will demonstrate a series of methodologies for achieving a performance-driven design and collaboration process. As a teaser... here is one technique that I will demonstrate showing an "ecology" of tools in use at once. The tools are connected together and sharing information using inter-process communication. 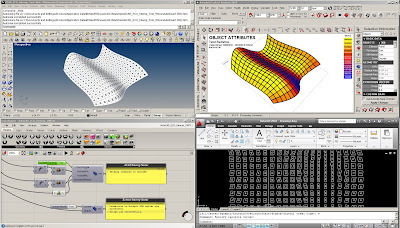 A change to the Rhino surface will update the connected software environments creating a dynamic design-analyze-document process. Credit: [uto] were the first ones to figure out the process for connecting Grasshopper to Ecotect and were generous enough to provide me with information on how Ecotect could be accessed remotely using DDE. The particular components depicted in the image are custom made 'from scratch' to suit my specific needs. 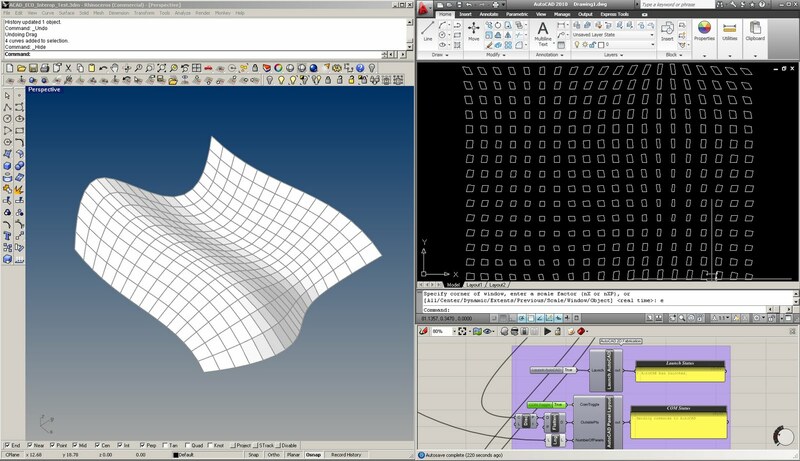 For those of you interested in a similar kind of Ecotect-Grasshopper DDE link, please refer to [uto]'s Grasshopper plug-in: Geco. For those of you interested in the COM connection to AutoCAD, you may find some sample code in my post here.